Tag Archive | "Exclusive Economic Zone"
The beginning of August 2017 saw the United States and the Democratic Republic of North Korea (DPRK) trading rhetoric that appeared to threaten nuclear war. It is possible, however, that the entire situation was an international legal trap laid for the United States. What at first instance appears to be two irrational state actors threatening nuclear war may instead have been a plan to undermine U.S. interests in the western pacific and to bolster China’s claims of sovereignty over its expansive view of the waters in the South China Sea. The rhetoric between the two states, and, in particular, the specifics of the threats hurled between the two states provide important clues. On one hand, the United States gave few specifics, but threatened to end the DPRK regime, to destroy its people, and to unleash “fire and fury” on the peninsula. On the other hand, the DPRK’s statements were specific. They might, at first blush, appear to give the United States whatever justification it might need to justify a preemptive attack against Pyongyang. After all, it did say that it was considering enveloping Guam in fire with ballistic missiles. However, in later providing its specific plans to launch four missiles set to land 30 to 40 kilometers (roughly 19 to 25 miles) off the coast of Guam, the DPRK may have laid a trap for the United States. By providing specifics, the DPRK simultaneously increased the heat of its rhetoric and pulled away any legal justification the United States might have to attack the DPRK, even under the specious Bush-era arguments for preemptive attack. This is so because the DPRK’s statement arguably did not threaten the territory of another State. The DPRK specifically stated that it would target the missiles to land in the contiguous zone, i.e., international waters, near Guam. In doing so, the DPRK’s statement was clear that its missiles were not intended for the U.S. mainland, Guam, or even U.S. territorial waters (which extend only 12 miles offshore). UNCLOS defines the contiguous zone as a zone of waters between 12 and 24 miles off shore. The contiguous zone is beyond the territorial waters, which extend 12 miles past the shore, and is part of the Exclusive Economic Zone (EEZ), which extends 200 miles offshore. As a part of the EEZ, the contiguous zone is considered “international waters” wherein states have limited sovereign rights in contrast to “territorial waters,” where a state retains most of its territorial rights and jurisdiction. In the contiguous zone, between 12 and 24 miles offshore, a state has the right to “prevent infringement of its customs, fiscal, immigration, or sanitary laws and regulations within its territory or territorial sea;” and to punish infractions of these rules. These rights also include the rights of the EEZ, which almost entirely revolve around the rights of mineral extraction and fishing. For the purposes of use of force and self-defense, however, the contiguous zone and the EEZ do not constitute the territory of a state. The U.N. Charter prohibits the use of force except in the case of self-defense or U.N. Security Council approval (preemption, responsibility to protect, and other justifications for force are almost always backed up with additional arguments for why the proposed use of force is not a violation of Article 2). The text of article 2 specifically prohibits “threat[s] or use of force against the territorial integrity” of another state. The rights of states are severely limited in their contiguous zones and EEZ. 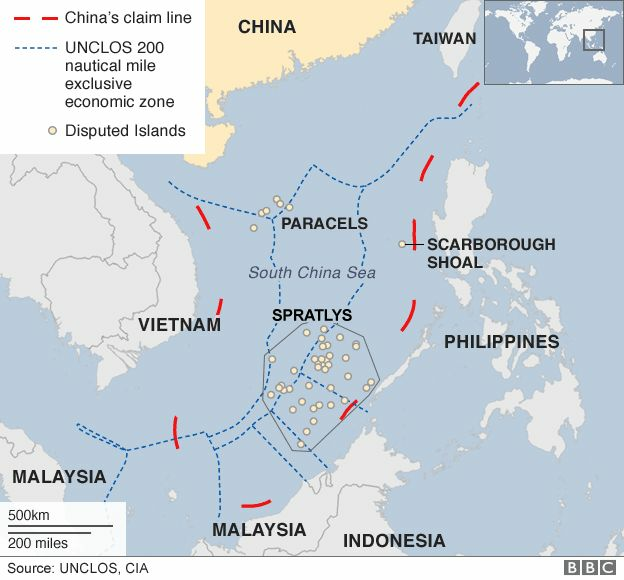 However, China has attempted to assert expansive rights over the South China Sea including some territorial rights in its contiguous zone and EEZ, as well as an expansive definition of its EEZ based on various outcrops of coral to which it lays claim, such as the Spratleys. The United States, China’s neighbors, and the international community at large have consistently held that China does not have territorial rights in the areas more than 12 miles off its coasts and that some of the islands, many of which China has built up into actual man-made islands, are not “islands” for the purposes of defining China’s waters under UNCLOS. Indeed, during the war of words between the United States and DPRK, the USS McCain sailed through the South China Sea in a freedom of navigation operation in protest of China’s argument of territorial control over the water around the Spratleys. China’s announcement of its neutrality in this matter should thus be viewed suspiciously. China’s agreement with the DPRK is that it is not obligated to participate in wars that the DPRK starts. If the missiles fall into international water, and the United States were to react by attacking the DPRK, China would be able to frame the event in a way that cast both the DPRK’s actions as an act of aggression, removing their obligation to join in self-defense, and the U.S. attack as an illegal overreaction to an act that never touched U.S. territory. Chinese neutrality should thus be read as one giving the DPRK notice of the consequences of hitting U.S. territory or territorial waters, and not that China will not help Pyongyang retaliate against the United States if the missiles were to fall harmlessly into Guam’s contiguous zone. With its statement of neutrality, China gives the Trump administration and U.S. public hollow reassurances, and a direct warning to Pyongyang not to miss its mark. In this scenario, by threatening an act which did not extend to the territory of the United States, the DPRK would incite the United States to assert territorial rights over the international waters around Guam. This U.S. assertion of rights immediately bolsters China’s claims in the South China Sea and increases the possibility that China may justify the use of force against U.S. vessels attempting freedom of navigation operations through Chinese claimed waters. In this scenario, any U.S. attempts to hem in China’s illegitimate and illegal territory grab in the South China Sea is undermined by U.S. statements in response to the DPRK. In this scenario, the above also comes to pass but the DPRK demonstrates conclusively that while it may be a rational actor it is also China’s patsy in its aspirations for global power. If the United States were to follow through with an attack on the DPRK, China would be the state with both the moral and legal high ground to begin to build a coalition against the United States in the international community. We can assume that this is already happening as China moves to expand economically into Africa and South America, but a catastrophic event such as an attack on the DPRK would serve to immediately crystalize resistance to U.S. actions worldwide. China, and, to a lesser extent, Russia would see immediate and long term gains from such a scenario while the United States would find itself alienated from its allies, not least of which, South Korea, which would bear the brunt of the DPRK’s response. Each of these scenarios reduces American power, both militarily and diplomatically, around the world. They increase China’s position in the world and push away allies and potential allies against China and even the DPRK. As of this writing, it is relatively fortunate that only the first scenario has come to pass, but in asserting expanded rights in the Contiguous Zone, the United States has still given China ammunition to use in the next flare up over the South China Sea. The only rational way forward is for the United States to reduce the temperature of the rhetoric and to attempt diplomatic solutions while also challenging China’s broad assertions of rights in the South China Sea. Using force against the DPRK or asserting territorial rights in Guam’s contiguous zone undermine U.S. policies and interests in both arenas. In the end, though, the United States must recognize the limits of knee jerk reactions and bluster and take full advantage of the capabilities of U.S. diplomatic assets in the State Department and in other agencies. The problems that the United States faces do not all come with military solutions, and issues of international relations and policy that appear simple on their face seldom are in reality. As the saying goes, the United States needs to be playing chess, not checkers, and never more so than when nuclear weapons are involved. William Kent is a 2014 graduate of the Sturm College of Law and holds a J.D., Masters of Law in International Business Transactions, Certificate in International Law, and Masters in Middle East Studies. He currently lives in Washington, D.C.